Are you one of those website owners that are dealing with the 403 Forbidden error on your WordPress site? This error is one of the most dreadful ones that a WordPress beginner can come across. Everyone who spends some time online has come across an HTTP status error. Few of them can be frustrating, like getting a 403 Forbidden error on your own WordPress website. This error code is shown when your server permissions are not allowing access to a specific page. 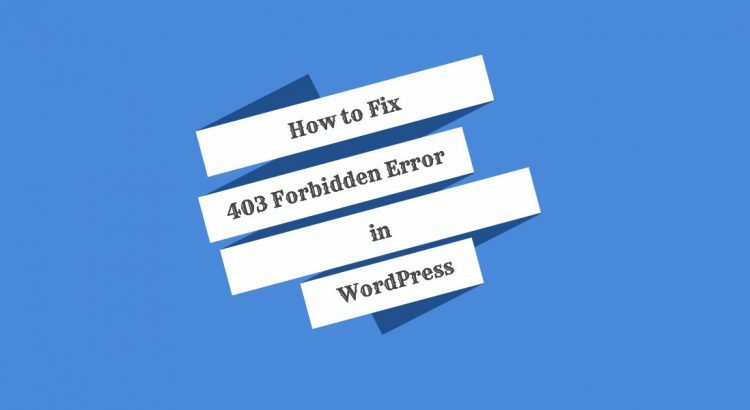 Here, we’ll share with you the 3 most common reasons due to which your WordPress site is displaying the 403 Forbidden Error and their fixes. First thing to do is to deactivate all WordPress plugins temporarily including security plugins that have been installed on your site. If this step stops this problem, it means one of the plugins is causing this error. Then, you can figure out which plugin was causing the error by activating one plugin at a time until you get that 403 error again. Our recommendation is to use as few plugins as possible. There may be some incompatibilities when using multiple plugins and you get a higher chance of a security breach when you have more active plugins. Incorrect file permissions can cause a 403 forbidden error on your WordPress site. It also makes the web server think that you actually don’t have the permission to access those files that you are trying to reach. If the above solution doesn’t solve the 403 forbidden error on your WordPress website then incorrect file permissions is the next thing to check. If you want to resolve this issue, connect to your WordPress site using an FTP client. Navigate to the root folder where all WordPress files are located. Make sure that all the folders on your WordPress site have a permission of 744 or 755 and all the files should have permissions of 644 or 640. After implementing this solution, the 403 forbidden error should be gone if that was the issue in the first place. Most often the error 403 is caused by a corrupt .htaccess file on your WordPress server. To be honest, repairing this file is quite easy. First, please connect to your website using an (s)FTP client or use the file manager in your control panel (if you have one). Next, locate the .htaccess file which is inside the root folder of your WordPress site. Remember that the .htaccess file is one of the system files so if you are accessing through a control panel, please enable the “show hidden files” option. If you are accessing through some (s)FTP software you’ll need to download the .htaccess file on your computer so that you have a fresh backup of it and edit it there. After that, you need to delete the file from your server. Try accessing your website once you are done with the editing. If 403 forbidden error is resolved and is not showing on your site then this means that your .htaccess file was corrupt and responsible for the problem that you had. You can generate a fresh .htaccess file from your WordPress admin area – just go to Settings » Permalinks page. Simply click on the Save Changes button that is found at the bottom of the page and WordPress will generate new and fresh .htaccess file. As you can see, the 403 Forbidden error is really nothing to be scared of but it will cause you some pain. Chances are that if you ever run across this issue you can fix it as simple as this and also with the help of our tutorial here. If you still can’t fix your 403 forbidden error on your WordPres site, contact us and we’ll fix the error for you. Of course, you don’t have to do any of this if you use one of our Service Configuration and Optimization Services, in which case you can simply ask our expert Linux admins to fix the 403 Forbidden Error for you. They are available 24×7 and will take care of your request immediately.